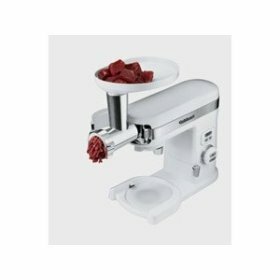 The Cuisinart Large Meat Grinder Attachment creates freshly ground meat in minutes. The unit connects to the slow speed power outlet on Cuisinart stand mixer models SM-55, SM-55BC, SM-70, and SM-70BC. The attachment comes with three grinding plates which create fine, medium and coarse cuts and two sausage nozzles for making large or small sausages. Die cast metal construction adds durability to the list of pros for this item. The assembly wrench, instructions and recipes are included, along with a limited three year warranty. Some parts are dishwasher safe. This unit is for more than just varieties of meat: grind nuts and vegetables as well. Mix your own sausages and grind meats to include only the cuts and fat content you choose. Invent homemade relish and meat salad recipes. Pick your own blend of ingredients to form sensational flavor combinations. Source the contents to go organic, free range, or grain fed to make your blends even healthier. People agree that the attachment is easy to clean, with no hassle to fasten or remove from their mixer. The handy pusher and tray help organize food and move it through the grinder efficiently. Metal parts should be cleaned by hand, a minor drawback considering all the unit will do. Here's another attachment to add to your mixer set.